In a fry pan add oil, garlic and ginger. Brown gently on medium heat. Add the roughly chopped mushrooms and cook for 5 minutes, stirring regularly. With your hands break the tofu into small chunks. Dice 1/2 a carrot into 1cm pieces and crush cashews and add to the fry pan, along with tofu. Cook for a further few minutes until the carrot is soft. Remove from heat and stir through Bragg’s soy sauce. 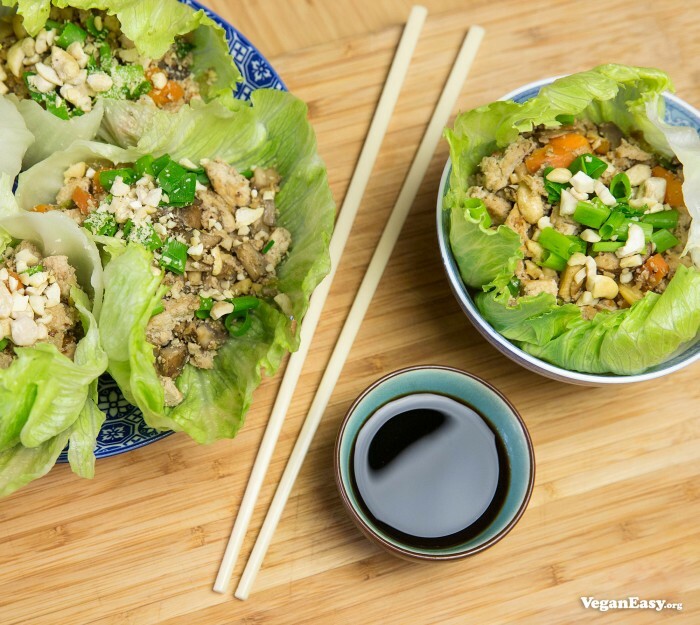 Serve in lettuce cups with crushed cashew nuts, chilli and cut green shallots. Made this tonight. It was super lovely! But it was a little bland so I added some things. Instead of shallots I used spring onions, and added bean sprouts, water chestnuts and sesame oil. Really needed the sesame oil!